Instead of doing my usual weekly series of Color Analyses©,™, (PAT. PEND. ), I'm going to divert for a couple weeks to concentrate a bit on what I like to call "score-following" videos ("ScoreVideos"). These are videos where the 'videographer' matched the music with the score so that a listener can follow along. I've posted these here and there on The Daily Beethoven before but I'm going to seriously start cataloging these things because they are so useful. Now about reading music...(and please excuse me if you are a sight-reader, because today will all seem very patronizing I suppose) - I am an awful music notation reader. For me to sight-read "Fur Elise" would result in a 3 hour rendition ("sight-read" of course means play the piece from looking at score and not from memory). Also my "internal voice" - that is, reading a score and hearing the music in my head without an instrument or singing - is about as accurate as the 10th person's recitation in a game of "telephone". Look at the black dots and don't worry as much about the vertical lines attached to them. The dots tell you the direction of the pitches. OK - now look at the vertical lines. The more lines attached to a note the shorter the note is going to be. Shorter means it will go by faster. Other even rhythms are 4/4, 2/2, etc...if you see a big "cents" sign in the beginning (or "C") then that means it's countable in 4's. What helps me alot is to either count under my breath, tap my foot, or "conduct" with my hand as the measures go by. That way, even tho I may be confused by a measure (bar) at least I'll still be on the right bar later on. Never stop. If a piece is a fast one, then I usually count in 2's (down-up-down-up...). If it's a really slow one, you can count to 4 twice in 1 measure/bar. If you get lost then the wonderful thing about these videos is that when the picture changes at least you're caught up! Just start reading and matching what you hear with what you see right then. Believe me, there's nothing more embarrassing then flipping back and forth through a score book trying to figure out where the performance is at :). These score-following videos prevent you from missing a repeat sign and all that. 2. You'll be interacting with the music as opposed to being a passive observer. It's kind of like a game - your eyes must follow along an invisible bouncing ball. The problem with "passive" listening is that it leads to "attention drift" and "background music-itis". Beethoven's music works remarkably well in setting a mood (and some of his stage music is intended for just that), but to really get the absolute most mileage out of his pieces, they can be experienced like reading a book, or watching a movie - or better yet, carrying on a conversation. 3. It's fun and gets easier the more you do it. Piano Sonata #2, Op. 2 No. 2 in A major 2nd Mov. 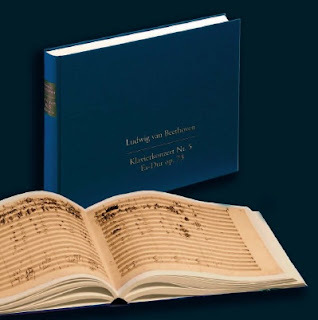 OK the below link will take you to a playlist (which I will try to keep updated) listing every score-following video of Beethoven's piano sonatas on Youtube. Many of these performances are not by "professionals" so don't expect Glenn Gould or Vladimir Horowitz, but they are great for exploring the works themselves. Of course there's no reason to feel any pressure to follow with the score, it just makes listening to Beethoven's piano works a different experience. Thanks for making this remarkable site. It's the kind of writing & analysis I wish existed all over the web, instead of the gossipy, florid, PoMo, content-free stuff one generally finds on (at least contemporary) music. If there's a way I could help with that, let me know. I'm a songwriter who's done a bit of analysis here and there (e.g. here: http://hipstersunited.wordpress.com/2010/12/08/hu-podcast-72-the-kaleidyscope-metaphor-in-teargarden/). My personal career agenda is to help improve the musical literacy of pop-rock-indie listeners, and to release music that's good & defensible by traditional standards. Nice! I love visual aids, a picture says a thousand words, etc..
Other writing of mine on the general subject can be found at my blog (this one would be most to-the-point: http://shoestringcentury.com/2009/10/26/escalation-restoration/). Drop me a line at grantvaldes@gmail.com if you've got some more specific ideas/requests for visual aids/etc. Cheers.